I knew that if I didn't post a picture of an antique porcelain statue of a monkey dressed as a French soldier riding a wolf, you probably wouldn't see one today. 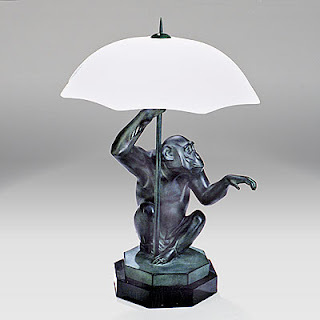 I was going to post a picture of a lamp shaped like a chimp holding an umbrella. But, you know. So cliche. Oh hell, here it is anyway. They're only cliches because they're rooted in truth, right? Giving my readers what they need. It's what I'm here for. 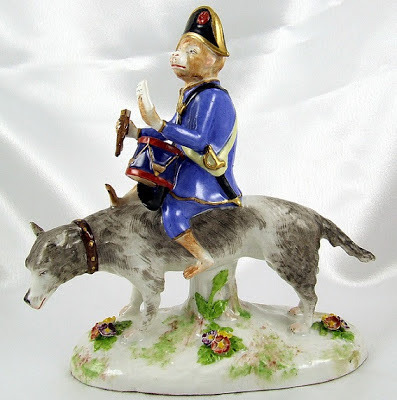 My day (and my life) was not going to be complete without a porcelain soldier monkey riding a wolf...HOW DID YOU KNOW THAT? ?